Sometimes it doesn’t seem possible that it’s been 17 years already. And sometimes it feels like it’s been forever. It was a Friday, April 23rd, 17 years ago. And my family was waking up to the reality of its diminution. We had lost my father five years earlier. And now we were waking up to yet another loss. The loss we all had known was drawing near. 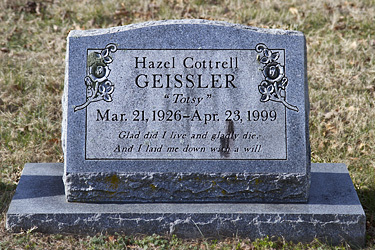 The loss of one Hazel Irene (Cottrell) Geissler. The loss of the woman known as Totsy. A woman so superficially simple: a daughter, a sister, a wife, a mother. A woman so astonishingly complex: a researcher, a community leader, a First Aid instructor, a business owner. A woman who wore everything out on her sleeve: her love for her family, her delight in a good story. A woman who hid so much inside: a lifetime of marital abuse, just for starters. A woman many people thought they knew so well. A woman few — and her children not among them — ever knew well at all. A woman whose life came to a close on that April 23rd, 17 years ago. A woman whose loss would render us orphans. The genes should have dictated a different result. Longevity on both sides, people living well into their 80s and 90s, and she was only 73 years old. But the genes were no match for a lifetime addiction to tobacco and alcohol. She, her father, a sister and others in the family all succumbed to that combination in their early 70s. And whatever chance there was for her children to breach the wall of complexity, to really get to know the woman, to resolve all those unresolved issues that are inevitable between parent and child… those chances came to a close too on that April 23rd, 17 years ago. The story of one life was ended. The stories of a lifetime were silenced. On that April 23rd, 17 years ago. What a beautiful tribute to your mother! Thank you for sharing it with us. Cathy said exactly what I’m thinking. Thank you for sharing. Those losses never seem to lose their power over us. Thank you for sharing what you did know of your mother, and how much you loved even what you didn’t know. I’m feeling this sort of loss especially this week. My own mother died on Sunday, April 17, 2016–just six days ago. I keep telling myself I should feel lucky she had a long, good life. And she did. She was a month and two days short of being 101. But age has nothing to do with how much we miss our parents. And now I, too, am an orphan, as my father died 16 years ago. I appreciate so much how well you write about your mother, and your family. Thanks for being so open. Gentle hugs on your loss, Doris — we are never ever ready no matter what. Judy, I’m so sorry in so many ways. For all of the lost opportunities and for your loss, itself. Thank you for being so open and candid. There are many who grieve those losses. It’s hard to admit our own parents failings, especially when their own actions are part of what takes them from us and deprives us of those opportunities. Perhaps your story will help someone else heal. She obviously was a good woman and brought a lot of good into the world, including you Judy. So many of us are so blessed to have you in our lives. May she be at peace watching you. 2008. Still so many Questions I want to Ask. I hope I leave nothing unsaid to my Sons that they want to know. I can tell she is missed. Great Tribute. All you can do is your best, True… and you know you’re doing that. Our mothers will always be missed and always they go too soon. We miss and regret the future potentials that could have been. The questions we didn’t realise we would not have forever to ask, the stories and life not shared that ended when we lost them. Thank you. You have a gift of putting feelings into words. For me it was 16 years ago. I lost my dad in July and my mom, four months later in December 2000. We kidded that God asked dad what he wanted for Christmas, and he said his wife. So God took her from us. Not only was I orphaned but I instantly became the older generation as my parents were the last of their siblings and spouses to die. A whole generation gone, along with all the childhood memories. Quite a tough year. Thanks for sharing your story. “Tough year” — talk about an understatement… wow.